What’s going on with the Spring Texas Real Estate Market? Pending Sales record a whopping 57% increase and home sales record a smaller but significant 16% increase over same month last year. Active listings are down, homes prices are holding steady, and months of inventory is returning to a balanced market. Good time to be a home buyer? Absolutely! Good time to be a Spring Texas home seller? Getting better. Months of Inventory for the same month last year the months of inventory has decreased by 18%. Sales for the month were up and active listings were down. We are starting to experience a return to a balanced market with months of inventory at 6.1 months. We typically see a decrease in months of inventory during November and December as sellers wait until after the holidays to put their homes on the market. Hopefully, the months of inventory will stay around the 6 month level or less into 2012. Sale Prices – YTD sale prices for Spring Texas homes are stable. The average price for the year over year is less but it could have more to do with more lower priced homes been sold as the median home price is holding steady. Quantity of Sales – Pending sales were a whopping 57% higher and closed sales increased 16% over November 2010. The increase is attributable to sales activity in 2010 being impacted by home buyers tax credits which pushed demand into the first six months of 2010. YTD sales volume is up 3% over last year and is projected to continue to increase through the end of 2011. Bottom line for Sellers: YTD sales prices are holding steady and months of inventory is down as a balanced market returns. If you held off putting your Spring Texas home on the market because buyers clearly had the upper hand, your waiting is over and it’s time to list your home. Bottom line for Buyers: 30-year fixed interest rates are still near historical lows in the low 4% range. Months of inventory is decreasing with buyers losing the negotiating power they have been enjoying all year long. If you don’t have the money saved for a down payment, ask your relatives for a gift. Don’t miss out on locking in 30-year interest rates at these ridiculously low levels. Want more numbers? 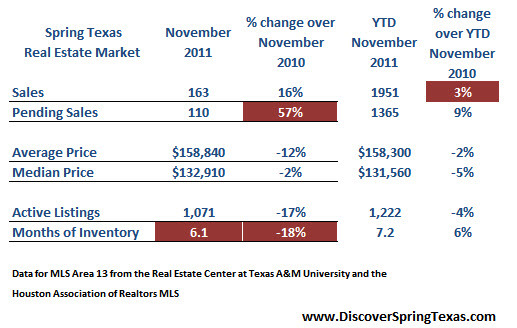 Check out past Spring Texas real estate market reports. The data represented is from the Real Estate Center at Texas A&M University and the Houston Association of Realtors MLS for single family existing homes in Area 13. Area 13 covers a large geographic area stretching from I45 to Hwy 249 to Beltway 8 to Spring Cypress. Not all subdivisions are faring the same. If you are interested in selling your Spring Texas home, give me a call at 281.804.8626 281.804.8626 to schedule an appointment.